Quick Definition: Both male ‘hemp’ (produces massive amounts of seed & fiber) and female ‘marijuana’ (produces sought after high-THC bud) come from the same “mother” cannabis sativa plant, as per US Dept. of Agriculture (USDA). Furthermore, cannabis sativa can yield a male brother – hemp – or a female sister – marijuana. Same family, different plants. Do you ever study interesting subjects while sweating through chores or getting things done around the yard? It’s actually one of the BEST ways to indirectly absorb information I find, as long as you don’t actually need to watch what you’re studying. This little amateur walkway project in the pic below was time consuming, but fun: scoring then clearing the dirt/grass, using a stomper machine to level it, laying the sterilized playground sand, then going brick by brick by hand to where the back gate will be once my roommate moves his tiny-home chunks to their new destination (there’s half on the right and left). Sorry about getting my dirty toes in there. What have I been studying? And yes, I like to plant some of them in colorful pots from thrift stores. I fill them with dirt, get the plant in there, then use a hammer to lightly knock out the very bottom of the pot before planting in the garden. I mean, I had to create the simple box with wood laying around, fill it with spare soil – nothing store/nursery bought – get the soil relatively clean, spruce it up with some garden mix on the top…boom. Is it even possible to fail at cooking herb and strawberry gardening? Marijuana on the other hand, you’ve got to be kidding me…the complexity levels around this particular type of cannabis blew my mind. I’ve been smoking the buds since the early 90’s and had…no…clue. Growing the stuff during prohibition was always way too risky for my blood. After hours and hours of listening to videos while working I think I got the basics, but my goodness, I didn’t even scratch the surface when it comes to cross-breeding, organic chemistry and everything that goes into strains with amazing cannabinoid profiles, or strains that mimic industrial hemp with minuscule amounts of THC and plenty of CBD. Whoa, then there’s all the cannabinoid science focusing on the chemicals found in the trichomes on marijuana buds. I think I’ll run out of house projects WAY before I understand a 10th of what you can do with marijuana plants. And that’s just the indoor stuff, I didn’t even start on the sativa strains that can easily grow outdoors in hotter climates – extravagantly different environmental conditions vs. indoor grows. Hemp on the other hand, well, it’s an industrial plant that’s typically grown on a wide scale outdoors for stalk & seed for primarily textiles and food. And hemp grows like a weed, within months being taller than myself (I’m a hair over 5’9’’ in a nice pair of Allen Edmonds dress boots) without much of any help from farmers or fertilizers. Hemp needs almost no pesticides or herbicides either, and less water than marijuana requires. Long story short…here’s what you need to know. Whether produced by a brilliant marijuana farming wizard, or by an industrial hemp strain growing wild on the side of the road, cannabidiol is cannabidiol. We won’t confuse that fact with the ‘entourage effect’ (more on this in a moment) and always remain mindful of how many other chemicals are involved with marijuana whole-plant extracts. To get your CBD from marijuana means you typically get it with a robust variety of interesting phytocannabinoid, terpene, stilbene, and flavonoid profiles. With industrial hemp, these profiles are dramatically streamlined – tiny amounts of THC, far less terpenes, less flavonoids, and other chemicals, but much higher levels of CBD. It’s important to wonder, why does the industrial hemp plant make so much more CBD and less THC? The fibers it creates can be stronger than steel. Again, the plant creates this protective shield in record time without the need of fertilizers, herbicides, pesticides, and less water than marijuana or even cotton. The plant is so strong is has been used to clean up toxic, even radioactive soil. Hemp produces 250% more fiber than cotton. Hemp’s 77% cellulose content naturally doesn’t require toxic chemicals such as dioxins and chloroforms to make paper – produces four times per acre as trees. You can grow it, continuously, in the same place for decades with negligible soil depletion. I could go on and on here. We’re talking about the KING of plants on earth folks, and yet there are some who would like you to believe its CBD-dominant chemical makeup is somehow inferior to marijuana’s. I’m a fan or marijuana and my respect for the plant and farmers continues to grow, but come on, hemp is FAR superior in every way but one – it doesn’t produce such florid THC-dominant chemical profiles. The human endocannabinoid system (ECS) doesn’t care, and can’t recognize whether the product has CBD from hemp or marijuana. Your ECS is already producing a chemical that’s an EXACT replica – mimetic – of CBD, the modified name is 2-AG (2-arachidonoyl glycerol). So, whether you ingest a couple drops of a Full-Spectrum Hemp Oil or a marijuana cookie with 25mg of CBD and 10mg THC, it’s supplemental. Your body already produces both, and your brain and organs are covered with cannabinoid receptors. Yes, they’re actually called cannabinoid receptors (CB1 and CB2). For example, you know what essential and non-essential amino acids are. If our bodies already make them, they’re non-essential, although we need them to survive… you get the idea – alanine, arginine, glutamine, etc. Anandamide: this is your body’s equivalent of THC. 2-AG: the body’s own CBD. Weird right, who started creating them first, us or them? And how or when did they converge way back in evolutionary history? Hopefully this makes more sense as to why pertaining to CBD, for the ECS it doesn’t matter which plant it comes from. We always hear about hemp being a bioaccumulator with a negative connotation, guess what – all cannabis plants are by definition bioaccumulators, along with TONS of other plants. It’s called phytoremediation – the ability of plants to uptake certain things from the soil they’re roots are dug into. Did you know Japanese residents around the Fukushima disaster began planting sunflowers by the millions, along with field mustard and amaranth to help clean up the toxic cesium and other toxins from the soil? All over the world, right now, plants are being put into the soil to leverage the process of phytoremediation. Hemp’s been heavily studied in this respect, and we know of its ability to absorb cadmium, chromium and nickel from soil, and that high concentrations of these heavy metals have little effect on plant morphology. Sounds like plant super powers to me! On the other side of that coin though, after everything I’ve learned about growing marijuana, I’m that much happier with legalization and state/local-level regulation of farming, producing and packaging. However, that’s not to say marijuana growers aren’t being caught using hazardous stuff to aim for higher crop yields, and more elaborate cannabinoid percentages. Regulation just dramatically lowers the chances. Here in my city, what do you think would happen to a marijuana grower with a presence in dispensaries (quickly becoming cultural hubs) if they got caught by all these environmental liberal stoners just once using something toxic to make a buck? Do not pass go, do not collect $200…it’s brand-suicide. I don’t follow the marijuana culture locally, so I wouldn’t even hear about it. That brand and all it’s crops would simply cease to exist because demand would dry up instantly. With industrial hemp farming at this point, there’s far less regulation. That’s a fact. The VAST MAJORITY of all Hemp CBD products you can purchase online are derived from imported hemp – China, Canada, India, European nations, etc. But there’s really no danger of hemp extracts being somehow dirtier because of hemp’s powerful phytoremediation or bioaccumulation. For marijuana, it’s a different story. With indoor marijuana growing you can use a smorgasbord of chemicals – so cleanliness is a real factor. From my chair here it’s not an issue. It’s primarily a selling point for the billion $ marijuana industry. Personally, I don’t consider cannabis (or any cannabinoid) medicine whether it’s hemp or marijuana. Not in the same way we consider hydrocodone or amoxicillin medicine. Meaning, I don’t think cannabis is something a doctor and only a doctor should be able to ‘prescribe’ to you. It’s herbal supplementation, of again, chemicals the body already creates. The argument is, well, because marijuana has such a complex mixture of chemicals, you can make it smell like orange sherbet, cannabinoids like THC or CBD can be bred to be so potent, as well as concentrated terpenes (strawberry gumball bud anyone?) it must be better. More often than not, anyone making this argument is either selling something or being paid to say it. I understand what’s meant by the idea cannabinoids perform better as a group; that they need each other symbiotically to ‘work’ in both the plants and in the human ECS. BUT, the question is, how much? Marijuana proponents always seem to combine the entourage effect argument with products that have huge and extremely complex chemical ranges. And make no mistake, industrial hemp extract has its own entourage effect. Whole plant hemp extracts ARE NOT the same as CBD isolates! Isolates: single-cannabinoid, made in a lab with machines. Full Spectrum Extracts: concentrates of natural plant resin & oils. Just imagine what the information battles will be like for the hearts and minds of Americans once industrial hemp farming is re-legalized and cannabis PR Wars truly kick off. A large complex variety of human health issues exist where marijuana, and thus higher THC/terpene percentages, and dynamic chemical profiles are more effective. These can differ from one person to the next. In essence, the more complex the function, the more cannabis ‘power’ is needed. There’s also an equally large and inter-related web of issues where minute amounts (making them legal under current federal laws) of THC, with a more streamlined CBD-dominant chemical profiles makes more sense. Remember, think of the power of the plant and how it grows, and why it creates the chemical profiles it does. If CBD is the primary sought-after cannabinoid, and larger percentages of THC aren’t desired or needed for whatever reason, hemp is the ONLY other plant-based source. At this point in time, there’s no other plant species in the universe I’ve heard of where you can get the types of extracts provided by marijuana and hemp designed through nature herself to work seamlessly in the human ECS. I love marijuana, but, I love hemp – two branches of one tree. CBD doesn’t catalyze into our cells without THC. When you REALLY dig into the science, you see that for the most part, on the molecular level the entourage effect is real. They perform their functions within the ECS as a team, in conjunction with hundreds of other chemicals. You need some THC, but again, how much? There is no universal answer. And I don’t care what any conventional or marijuana industry studies say – the anecdotal evidence is clear and has been mounting for years (in reality, for MILLENNIA). One person will see better results with these strains of marijuana, in edible form, for this specific health issue or that, while the person standing next to them will swear by hemp extracts only because of X and Y.
He’s right about those strains being high-CBD low THC, I’ve tried both myself here in Washington State. And he reminds me yet again of how confused I was after all those hours of listening to people go on and on about how to grow marijuana indoors. 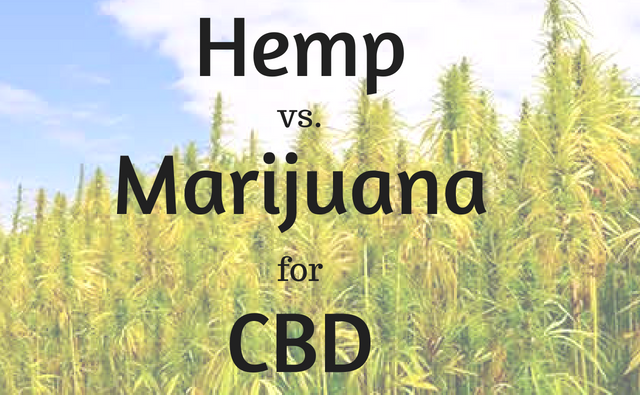 High-THC concentration issues aside, when considering where to get your CBD from, marijuana vs. hemp, just look to the farming methods. The more you learn about how these two plants are farmed, the more you’ll understand in terms of the ‘quality’ of your end-product – edible, capsule, concentrate, etc. Hemp extracts like those for sale on HempforFitness.com, are usually going to be nothing but the plant concentrate (some have herbal compliments) so you don’t have to worry about additives or extra sugars and things. This is the #1 reason I don’t buy edibles from dispensaries – they’re like the cookies I wouldn’t buy from supermarkets because of their ingredients, but with marijuana extracts added. I prefer smoking buds. And, if I ever get around to growing my own marijuana, I’ll make my own edibles with my own ingredients for personal use – the way I like them. About as many people who buy marijuana products from dispensaries know the farmers, as people buying cigarettes from corner stores know tobacco farmers. Personally, as I mentioned, I’ve been supplementing my ECS with marijuana for over two decades and guess how many actual, real farmers I’ve met…zero! The neat thing about small companies like HempforFitness.com is, because you can purchase the full spectrum hemp extracts online, you can reach out and directly connect with, call, and get to know your supplier. Until hemp farming is legalized, sources will almost exclusively remain outside the continental U.S. Even then, it’ll take time to build the infrastructure necessary to start supplying all the domestic demand for hemp extracts with domestic hemp crops.